Hey, Wolf Blitzer! Know what the situation is, in your Situation Room? Looks to me like the situation is that Andy Richter controls the universe. At least as far as "Celebrity Jeopardy" goes! Tonight's episode of Jeopardy kicked off a year-long "Celebrity Jeopardy" contest in which twenty-seven former contestants vie for a one-million-dollar kitty, to be donated to the charity of their choice. 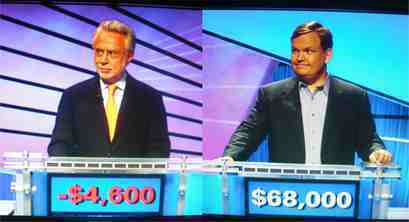 The Tonight Show's Andy Richter went up against CNN's Wolf Blitzer and Desperate Housewives' Dana Delany. Youch. It was like Blitzer walked right out of those SNL sketches, where the "celebrities" are hapless, self-obsessed incompetents! Richter's charity of choice is the St. Jude Childrens' Research Hospital. Seeing as how Jude is the patron saint of lost causes, perhaps Blitzer stands to benefit after all.